So today had big promise. According to the brand spankin’ new Clear Sky chart for the observatory, we were going to have clear skies this morning and decent conditions for the first time since the beginning of October. Talk about exciting! So I got up at 4:30am and got the Z8 outside and cooling, grabbed a bite to eat and then started to get down to business. Check the collimation of the scope (I haven’t done that in a year). Practice with the hiss drive and leave the valve in the correct setting for next time. Align the Telrad (I removed the wooden mount and affixed the base directly to the OTA. Try to get the Frankencam working. Along those lines, start to get SharpCap2 settings up to snuff. As a backup, see how the Fujifilm Finepix camera works afocally with the hiss drive. Spot Mars and observe (and take a picture?). Spot Comet ISSON and observe (and take a picture?). Yeah, it was a busy schedule. Would the weather cooperate? I went to bed under a blanket of clouds, woke at midnight to help one of my kids to the potty—under a blanket of clouds. When I woke at 4:30 and slipped downstairs, I spotted few stars out the window. Good enough to at least practice with the hiss drive! When I stepped out onto the driveway though—WOW, talk about a lot of stars. I don’t know if it’s because I haven’t seen the stars in about a month, or because it was just that dark and clear, or maybe the neighbors lights were off…I don’t know but MAN it was stellar overload. And my eyes hadn’t even adjusted yet! After standing in the driveway for about ten minutes (yeah, I kicked myself for “wasting” time later) with my mouth hanging open in wonder, I pulled myself together and hauled out the gear. With the Yard Canon cooling (I finally added the powerstrip to the rover and was able to plug in the cooling fan) to the ambient 29º, I set to work after a bowl of cereal. Top priority, since this was hopefully going to be an actual observing session, was to make sure the scope was collimated. To my complete surprise, the laser was spot on in the center. Being a little suspicious that the telescope had sat unused for nearly a year in the garage and had been moved around and bumped during the construction of the rover, I decided to do a star test as well. I defocused a star until it was a large disk. The Secondary mirror shadow was dead center. I moved the defocused star around the FOV and it remained dead center. Huh. I scratched my head at how this could be, then shrugged and moved on. Next I had to set up the hiss drive and get that going. Well…cold fingers and increasingly frustrated, I found myself 30 minutes later spying the first hint of dawn in the east. And I still hadn’t got the damn thing tracking near as well as I did last time (a week ago?). At best, I was able to get the stars (I think!) to slow down a little…but it was so slight I had hard time figuring out if it was real or my imagination. I really thought I had the concept figured out last time. I just don’t understand. I must be pushing it too fast. I had the alignment about as tight as I can get on Polaris and at the proper angle…there shouldn’t be anything else to this thing, but it is getting to be maddening. At last, I resorted to the nuclear option (I threw my hands up and said “f***-it” lol) as I was wasting precious time. I couldn’t really tell if the hiss drive was working or not and just let it be and sought out Mars. The Red Planet was actually easy to spot and I was able to take it all the way to the 300x (4mm Plössl) and saw a small, but mottled orange ball (a little brown and a little white for the polar cap). Knowing that Mars is going to get bigger every day until February, I didn’t spend to much time there and tried for Comet ISSON. Unfortunately, this was also when for the first time in my “career”, I encountered a frosted over Telrad glass. I was completely at a loss. I have only ever encountered dew once in 19 years I’ve been observing. I do remember one time last year when the OTA had frost on it, but never on glass or optics. Needless to say, the Telrad was rendered useless. I couldn’t even get it properly aligned. After fumbling with my shirt, then my fingers, trying to clear the glass, I gave up. Trying to spot ISSON (even after I figured out how to get the plotting data in Stellarium—that’s pretty neat by the way) proved fruitless. So…no go on the hiss drive. No go on comet hunting… Telrad rendered useless….the day was turning out fabulous. I steeled my resolve and tried to get the Lifecam working. This, actually, met with moderate success. 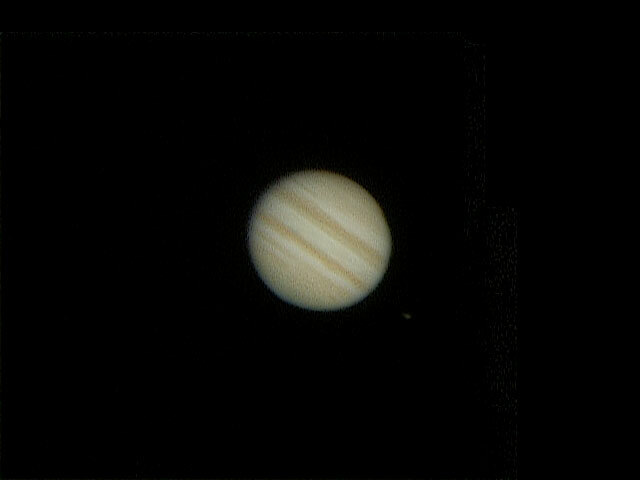 After centering Jupiter in the eyepiece (got to use a ladder now since Jupiter is so high in the south at dawn and the hiss drive rover bumps the sope up a few inches) I carefully pulled out said eyepiece and installed the frankencam. I was instantly delighted to see the overexposed circle and four little dots appear on the SharpCap screen on my netbook. I quickly got down and monkeyed with exposure settings…only to see SharpCap lock up. Then the cursed MS Lifecam settings menu popped up. The darn thing was trying to override SharpCap. I quickly disabled it and went back to SharpCap, to see Jupiter had drifted away. Clearly the hiss drive was not working. Eventually I was able to somehow get SharpCap set properly and have Jupiter in the FOV (barely) for about 12 seconds or so. Satisfied with my first attempt, I tried again and failed. And failed, and failed. With the hiss drive not tracking, I began to see the real advantage GOTO scopes have over dobs. 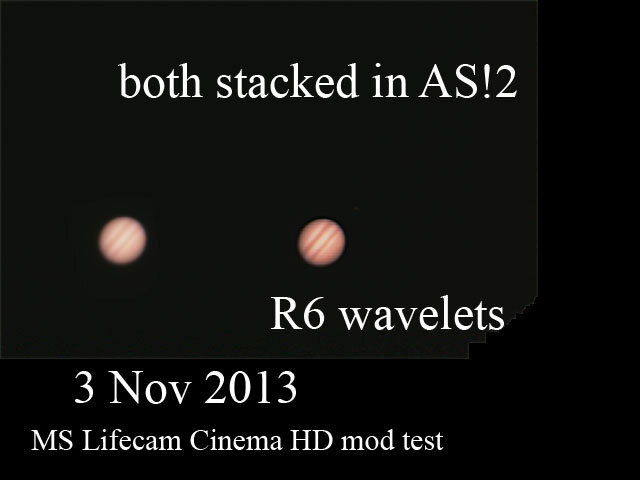 Finally I gave up trying to get Jupiter in the FOV….the Telrad was an ice cube and I had had enough. With time starting to run out (it was now 5:45am) and my daughters baby monitor squawking that the was stirring, I kicked into desperation mode and reached for the Fujifilm Finepix, the afocal workhorse. I got Jupiter in the FOV of the 9mm eyepiece and lined things up. I held the camera up to the eyepiece and started recording, using the optical zoom. Wow what a nice image of Jupiter, both bands visible and pole darkening, and at least one minor band visible too. At least Jupiter was helping me out! I recorded a half dozen videos of the gas giant slowly drifting across the FOV…much slower than I remember from last year when I did this. Did the hiss drive have a part in that? I have no idea. At any rate, by then the glow in the east had washed all but maybe a few stars and Jupiter. My daughter needed to go potty. My hands were frozen. The Telrad was iced over and the scope had a nice layer of frost on it. Sighing in frustration, I turned to unplug the extension cord and in so doing, bumped the little table my netbook was on. With a heart stopping clatter of plastic and wood on asphalt, the netbook, an eyepiece and my 2x Barlow displayed the properties of gravity for me to witness in horror. Luckily nothing was damaged except my nerves. That’s it! The last straw. Despite the clear, crystalline skies, the stars had aligned against me. Not the for the first time did I dream of how nice it must be to have a decent GOTO scope. I had an hour and a half out under the stars and thanks to all the other “things”….I spent maybe ten minutes observing Mars. On the plus side, I did some rudimentary processing of the data I did manage to collect. I first took the .avi files (both SharpCap and the Fujifilm produce movies in this format) and ran them through Autostakert!2, the moved the stacked and averaged image to Registax 6 and adjusted wavelets. Since I really only know enough to be dangerous to myself (and my pictures) I quickly moved into Photoshop (CS2) and played with levels, curves and brightness/contrast. All that took maybe 10 minutes per image. On the left you can see the result from SharpCap un-messed with. On the right, the image that Registax threw up after I tickled the wavelets somewhat randomly (did I mention I don’t know what the heck I’m doing?). The fiddled-with version is clearly better. Nothing like what some people have gotten (some with scopes half this size) but it’s a start. I will have to try the Barlow next time. If nothing else, it proves my brain surgery on the webcam last year was not a failure. Just another thing to practice with, I suppose. Now, when I processed the Fujifilm movies, I got to smile. All was not lost today. The image is easily many times bigger, brighter and more detailed than the SharpCap image. See for yourself! You can see the image of Io, Jupiter’s moon, disappeared from the second image, where I pushed the data further than in the first one. The result was a better picture of the planet at the cost of the moon. Not bad for afocal work!! Easily my best image to date. After processing I am pretty happy. They are not masterpieces, but it’s a start! Why they look so much better than the SharpCap file I have no idea. I think what I need to do now is get that blasted hiss drive working. There has got to be something I’m missing. Something so simple cannot be this hard. Part of me is ready to scrap the whole shebang, sell everything and start over with a GOTO. But the other part of me is too stubborn to quit yet. So I failed 3 of four times when I tried the hiss drive. The 25% success rate a tracking is better than the 0% tracking I had this time last year. But man, add in the horrible weather we’ve had lately and I am one gloomy skywatcher.